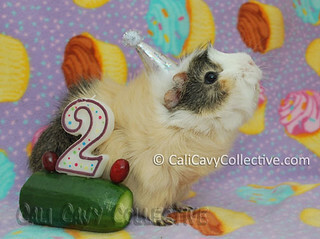 March marks several things - the beginning of spring, the official Adopt Rescued Guinea Pigs month, and for us here, the two year anniversary of the Cali Cavy Collective blog! I'd like to say a heartfelt thank you to everyone who has taken the time to visit this piggy bean-covered corner of the online universe. I've gotten to know so many wonderful members of the guinea pig community and have truly enjoyed hearing from each and every one of you. The stories you share about your peegs never fail to make me smile. It's amazing how we come from all walks of life but can connect through a shared love for wheekers and their desired well being. I've been meaning to ask if there is anything you want to see more of on here: videos, cute photos, DIY/How To articles, crazy cavy shenanigans? Any topics in particular, such as cage, bedding, food or toys? Feel free to let me know! Thank you too for your time spending to share with us your knowledge and your tips!!! It's all good - I've been enjoying all of your posts! I agree, I like all of your posts! I like to get tips on what other piggy slaves feed their peegs. Thanks to a comment by Painted Thread earlier this month on your blog, I tried chicory today and all 3 of my girls went crazy for it! It's always fun to learn new things for them. Photos are always welcome, but love all your posts. Thank you for the comments - I'll certainly keep them in the back of my head for the future!